Indie Retro News: C64SD V3.0 PRINCESS FLC - The best SD2IEC device improved even further! C64SD V3.0 PRINCESS FLC - The best SD2IEC device improved even further! Truth be told, of all the C64 devices we've featured so far this is by far one of the best, coming second to the 1541 Ultimate-II. You can read our review (Here) of why it was so good! 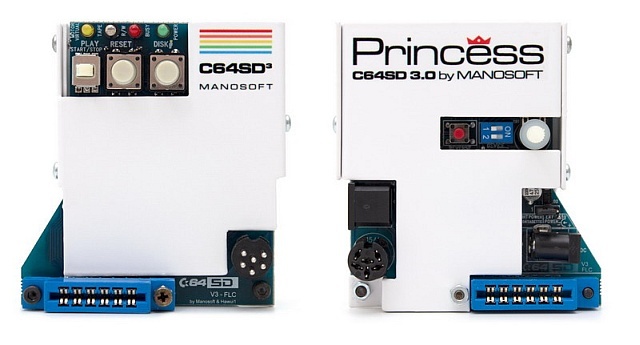 But enough about our review, today we are here to tell you, the C64SD V3.0 Princess has just got even better with the in development ' Princess FLC (Full Logic Control) microcontroller ' that gives this fantastic device some unique new features, of which you can read below. There are also some minor fixups in the initialization of the SD Card making it faster than its predecessor. The PCB has been redesigned to reduce external interferences even further and to rationalize the power supply section.The new FLC will also offer the possibility to grab in "stand-alone" mode without the need of using a Commodore computer. This latter functionality requires an accessory that is going to be commercialized and has been already successfully tested. To grab tapes you need just a C64SD, a Commodore computer (as of now, then with the new accessory the computer won't be necessary anymore as said above) and a C2N datassette. 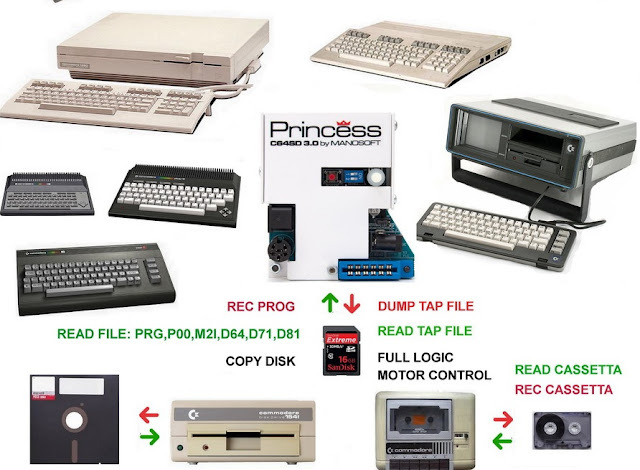 If the C2N is a 1531 (Black type) you need also the Princess Pack (that has the adapter for it) the adapter for the 1530 (White one) instead is already part of the standard package of C64SD. Please note that with any Commodore Computer you can grab tapes on any other model of Commodore Computer, for example you can use a Commodore 64 to grab the tapes of a Plus-4 or vice versa. All the TAPe features will work for both NTSC and PAL computers. Phew and that's that, now you can see why Hawui Hawui's explanation was a little better than mine, and gives you a more in-depth look into this new feature to the original device. If however you wish to know more including current updates and to purchase the Princess, see the links below.